The diary carried by Maurice O’Neill, from his first entry on 26 August 1915 as he left Australia bound for the European war, through to his final entry dated June 26 1916, three days before his death during a raid on German trenches at Armentieres has been donated to the Gippsland Armed Forces Museum. In the weeks following Maurice’s death, his brother Simon continued the diary, initially as he marched with his battalion from Armentieres to Pozieres’s Wood, and subsequently during his evacuation from France and convalescence in Britain suffering from shell shock. The diary, transcribed and annotated by Graham O’Neill, with Melissa Haldon, provides a graphic insight into life at the battlefront as well as the thoughts of the soldiers about home and their loved ones, particularly through Simon’s poetry. 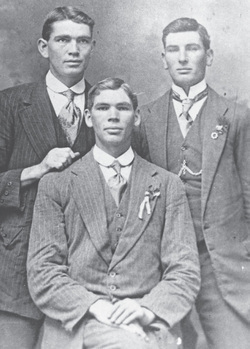 Read the compelling story of the O'Neill brothers in this annotated transcription.